Having abandoned a previous life as a professional bass player (at one time a member of Bo Diddley’s backup band apparently), Roden’s first recorded output as a composer is an epic undertaking released on the Berlin-based Solaire label. Solaire is a relatively new addition to the world of classical music imprints, and they aim to release “…original, daring and truly exciting interpretations”. Other releases include works by Liszt, Bach, Nimrod Borenstein as well as Roden’s second volume of Threads Of A Prayer. This first volume is almost three hours of beauty. Roden describes his compositional process as “…a kind of elongated improvisation…” and goes on to express his “…intention of providing a specific experience for both myself and listener. The intention of the experience is material and spiritual; to involve the mind and soul of myself and the listener in a connection with ourselves, each other, and the place from which the music begins, from its own source and eventual existence”. In case you missed that, Roden’s interests are noticeably metaphysical and spiritual. Prayers are not referred to as just some kind of handy technical device, but appear to be actually one of Roden’s pass-times; his text of the twelve prayers are reproduced in the accompanying booklet. There are also short texts for “The Many Latitudes Of Grief” and “Leaves”. Sandro Ivo Bartoli is the pianist who realises the material on the first disc; “Twelve Prayers”, “Untitled 10 Pieces” and “The Passing Of A King”. All recorded nocturnally, presumably to minimise the distractions of the daytime world. Bartoli’s own credentials include study at The Florence State Conservatory and London’s Royal Academy of Music, and he has since amassed a substantial catalogue of recorded work. The pieces presented on this double album are the product of five years’ work. I hesitate to refer to the Wandelweiser collective even though Roden uses a similar approach to creative use of quiet passages and silence. Roden’s restraint in directing the sounding of instruments gives rise to opportunities for the listener to become aware of environmental sounds – Michael Pisaro’s comment about first hearing recordings of Kunsu Sim’s work, “…The music also revealed the complexity of “silence” itself. Silence in music was not the cessation of sound, or even a gesture: it was a different sound, one with more density than those sounds made by instruments” comes to mind 1. 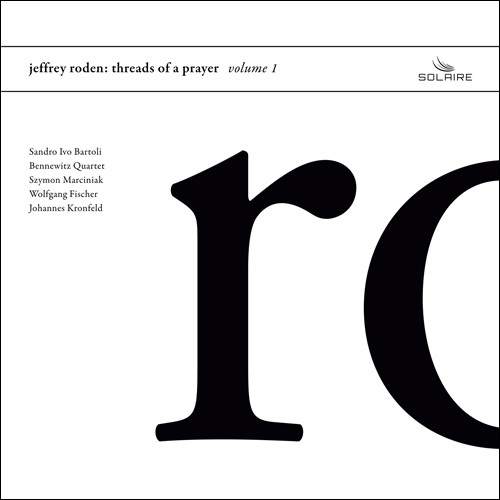 The Wandelweiser group of composers and artists are nothing if not fascinated by the idea of “silence” as a compositional tool, similarly, Jeffrey Roden seems to be operating in an unwaveringly removed, or separate manner when considering the potential around intentional sound. He states: “Time is of monumental importance in my work and I spend quite a bit of energy and focus on the amount of time that elapses between sounds and in the decay of a chord or note”. Roden takes this ultra-measured approach to his material on “Twelve Prayers”. These are twelve individual pieces which coalesce into an almost monumental whole. The results are quietly powerful featuring languid triads and repeated chords; heavy, complex, but not oppressive or foreboding, rather, it seems to me, they are hopeful. Roden also claims he not only deals with silence but with space. Some passages here are tonally opaque, others contain melodic filigree. The fourth prayer could be a rough sketch for a torch song, almost. On the sixth, the piano sustain pedal is firmly depressed giving the minimal keystrokes a glassy resonance. The ninth, in contrast, is fragile and discordant. By the sixth untitled piece, the mood changes; much more disconcerting, a dark chord and a nagging B repeats before see-sawing intervals and a fracturing cluster of notes. The material on the second disc differs from the first in that the music is performed by a group; Bartoli again on piano, Szymon Marciniak on double bass, Wolfgang Fischer on timpani and Johannes Kronfeld on trombone plus the Czech strings players, the Bennewitz Quartet. The sixth part of “The Many Latitudes Of Grief” is like the calcified skeleton of a David Sylvian tone poem; with offset melodic counterpoint, a terse performance; dragging emotion forcibly out of the instruments and into the listener’s breast. “Leaves”, despite its intertwining of dissonance and melody, and the two quintets presented here are more grounded in the unsurprising in comparison with the otherness resulting from the five year gestation-period of “Twelve Prayers”. For me, they have a familiar feel, perhaps looking to the past while “Twelve Prayers” looks to the future. The brevity of the vast majority of the pieces works in the favour of the album as a whole. “Leaves”, wisely chosen as the closing piece, is the longest of all the pieces by a long chalk at just over 35 minutes. The almost three-hour spread of Threads Of A Prayer volume 1 looks like a massive undertaking at first sight, but is actually very easy to digest – I wanted more, in fact. I look forward to getting hold of the next volume.